Integrate all sales channels and manage Your orders with Multiorders – multichannel inventory and shipping management software – a perfect workflow optimising solution. Connect all of Your shipping carriers and print labels with just one click, manage pricing and stock levels of all sales channels from the same place. If you want to reach a bigger audience - it is always a good idea to enter new marketplaces. All of this, is made easy by our Multiorders software. It will help You save time on printing labels, updating marketplaces with tracking info, tracking inventory levels and pricing. Multiorders integrates with the most popular marketplaces like Amazon, eBay, Etsy, Manomano, Houzz and shopping carts like - WooCommerce, Shopify, BigCommerce, PrestaShop, Ecwid and others. Connect all of Your carrier accounts like UPS, Royal Mail, Parcelforce, DPD, myHermes, Parcel2Go to Multiorders and print labels in seconds. Instead of wasting your time with a “copy - paste” routine, you just need to click the order which you want to ship, choose your courier and the label gets automatically generated. Your order will also be auto updated with status and tracking info. Plus, You can save on shipping expenses by using multiple carriers - it’s easy with Multiorders. Once a retailer gets an order, there is a list of time draining tasks to do afterwards. Multiorders knows your time is important to You. You won’t need to switch over many sales channels again and again to ship Your orders - You will see them all on our software. Ship with Multiorders and update Your pricing, stock list and tracking info instantly. Now you can fulfil your orders with just a few clicks! Multiorders let's You integrate all of Your sales channels, such as eBay, Amazon, BigCommerce, Etsy and many more. This software will automatically import products, customer information and orders from all integrated channels. Multiorders shipping management software will help You ship orders, track inventory, update marketplaces with shipping details, pricing and stock levels. 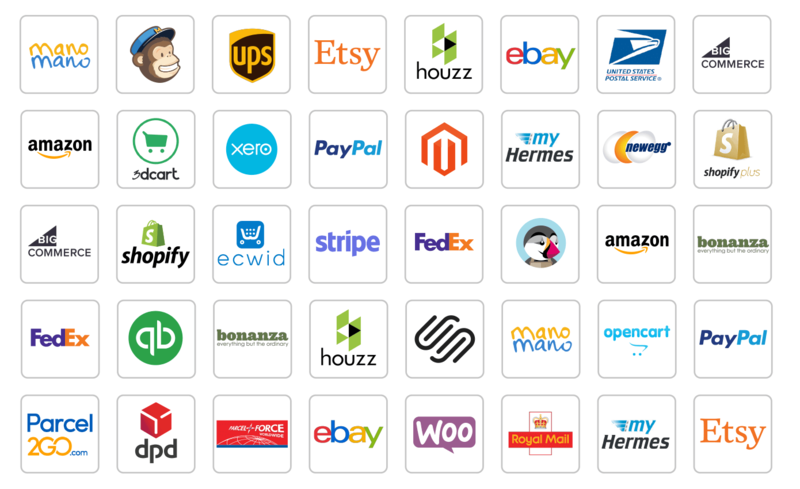 Multiorders shipping management software supports the most popular marketplaces like Amazon, eBay, Etsy, Houzz, Manomano and Bonanza. As well as the most widely used shopping carts such as Shopify, WooCommerce, BigCommerce, SquareSpace, Ecwid, 3dCart, Magento 2 and PrestaShop. All of this can be efficiently shipped with carriers like DPD UK, USPS, Fedex, UPS, Parcelforce, Royal Mail, myHermes, Parcel2Go.